Illtud Llys Dunsford is not only an award winning Charcutier and a Nuffield scholar, he is committed to and passionate about conscious food production. Recently made chairman of the slow food movement in Wales, his products are delicious and wonderful and of the highest quality. We are very lucky to have had him at fforest to teach us all about charcuterie and sausage making at Gather last year, he will be joining us again for both weeks in August for his second year as a fforest Gather contributor - we cannot wait! 'So how did this little business come about? Well, firstly I should introduce myself – I’m Illtud Llyr Dunsford, it’s a bit of a mouthful I know! I’m sometimes known as Illtud, sometimes as Llyr and quite often known by my nickname ‘Bob’ too. I’m from a farming family, and we’ve been rearing animals here in Carmarthenshire for a couple of centuries now. Although I was born and brought up in Cardiff, my weekends and holidays were spent on the family farm, and when the opportunity arose, I moved to the farm to live in 2004. As a family we’d always reared animals for ourselves – turkeys, chickens, ducks, lamb, beef and pork. Having a real passion for cooking it seemed like a natural progression for me to take over the reigns when it came to processing our animals. One animal in particular had a special place in my heart – the pig. We’d always salted our pork in the traditional Carmarthenshire method, encasing the animal in salt in a slate tray before hanging and air drying. Using traditional family recipes as a base I expanded my repertoire of produce and developed various new processes. Some things worked and some didn’t, but I loved the thrill of experimentation. One year I salted a leg, but unfortunately I hadn’t managed to get enough salt around the bone which resulted in a miss-cure – the following year I decided to de-bone the leg, splitting it in two prior to salting. Unbeknown to me, I was making a variation of Culatello, one of the most prized Italian air dried meats. I was heartened to think, a few years later when I found out about Culatello, that at some point an Italian farmer had probably had the very same problem as me and had decided to take the logical path of splitting the leg. My working career couldn’t have been further from charcuterie production – I’d initially trained as a photographer, then moved to work in the film industry for the Wales Screen Commission, attracting film productions to Wales. During my time there I worked on over 150 different productions and was very fortunate to work on some pretty big projects including Harry Potter and the Deathly Hallows Pt 1 and Pt 2, Robin Hood, Stardust and Doctor Who. 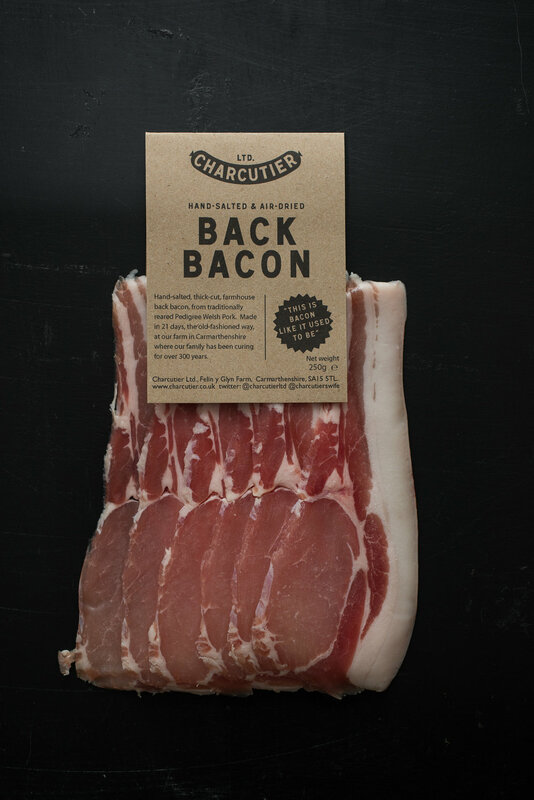 For a few years I’d been looking to start a business from the farm – it’s where I’m happiest, so during the winter of 2010 I made the decision to leave my job and start up Charcutier Ltd. That’s when the work really began, I spent the next twelve months researching processes, developing products and attending every kind of training event I could find. I’ve been a devotee of the St John mantra – Nose to Tail Eating and I wanted to find a whole gamut of products that would make use of ‘everything but the squeal’. Thanks to the Welsh Government’s Re-Act Scheme I secured grant aid to attend a series of training courses including attending the 33rd Annual Sausage and Processed Meats Course at Iowa State University in the USA. There I got to rub shoulders with a range of professionals, ranging from small producers like myself to the biggest meat processing companies in the World. Later in the year I returned to the US as part of a Hybu Cig Cymru/Meat Promotion Wales Livestock Scholarship, I spent just over four weeks looking at both livestock rearing and pork processing and blogged about it during the trip. I also managed to squeeze in a trip to the Parma Ham Festival in Langhirano in September 2011, a must see for any air dried meat devotee. I’ve continued to research and undertook a further Italian trip to Perugia in 2012, specifically to the famed town of Norcia renowned throughout Italy for its butcheries. The trip also allowed me to look at some bespoke equipment for the Italian salumi industry and later that same year I visited Germany for that same purpose. I continued with my studies in 2013 with a visit to see Kate Hill at her cooking school in Gascony, and took a tour of the French Basque region to learn about Bayonne Ham and the Basque Pig. Thanks to a Taste Local bursary I also visited Denmark to look at the full pork supply chain from small niche Organic pork units to intensive systems.